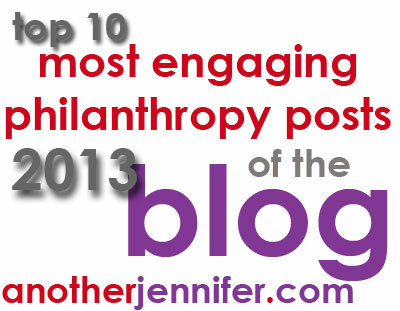 Since this is the last Philanthropy Friday of the year, I thought it would be fun to reflect on the top philanthropy-related posts on this blog in 2013. When I searched for the posts with the most comments, it wasn’t surprising that some of my good friends and most favorite nonprofits came up. If you missed a few of these, I hope you will go back and read. They are some of my favorite posts as well! Flush for Good: Celebrating World Toilet Day with Awareness and a Giveaway! Clean water for drinking and bathing is a very limited resource that we need to protect. I partnered with American Standard to celebrate World Toilet Day and gave away a $200 Lowe’s giftcard while American Standard donated 20 sanitary toilet pans to a community in need via BRAC USA and WaterAid. Saying Goodbye Saying goodbye to my first dog, Kona, was one of the hardest things I’ve ever had to do. My October Giving Pledge donation was to the shelter from which we adopted him. Philanthropy Friday: World Moms Blog World Moms Blog is a collaborative website that writes from over 20 countries on 6 continents about motherhood, culture, human rights and social good. Plus Jen Burden is pretty awesome. Philanthropy Friday: Empowered By You Empowered By You is a new luxury lingerie brand created by the Seven Bar Foundation, a nonprofit organization that aims to empower women throughout the globe via microfinance. This is also the first Philanthropy Friday post that made me blush. The Power of Dance I’d hate to live in a world where music, dance, art and creativity isn’t a regular part of my life. For my Giving Pledge in June, I tried to give a little back to this community. Philanthropy Friday: Feeding Our Kids 7 Day a Week Feeding America’s BackPack Program helps children get nutritious and easy-to-prepare food to keep them fed on the weekends. G and I have a great time volunteering for our local backpack program. Thanks for being along for the ride in 2013! I loved most of these posts, and the ones I didn’t see? I can remedy that easily today. Ilene and I were talking about you and your wonderful blog the other day. I really wanted to sneak up to Maine for some moose, and some coffee with you. One day. Tamara recently posted..Do I Want a Third Baby? Yes. One day soon I hope! We might have to travel north for some moose. Road trip! I’ve been mostly off the grid, but I had to come over when I saw your tweet! 🙂 I remember most of these and I especially loved Ilene’s…I have a soft spot for all shelter pets! Me too, Michelle. I’m so glad you were on my blog this year. It’s been nice getting to know you. I hope we can meet in 2014! I remember reading all of these, Jen! You know how much I love your PF series! So long as you keep writing about these great ways to give back, I will keep reading and spreading the word any way I can. And thank you for featuring me. Honored. I love writing about philanthropy! Thanks for stopping by, Rachel.